I was recently contacted by the wonderful Magnitone about their new advertisement and upon giving feedback they were super lovely and offered to send me out some of their new brush heads for my Magnitone Lucid. I picked the Silk Bliss brush heads and The Stimulator brush head and here is how I got on with them. I was completely in love with this brush head as soon as I took the lid off, It is the softest brush I have ever felt, The bristles remind me of a powder make up brush, they really are that soft. 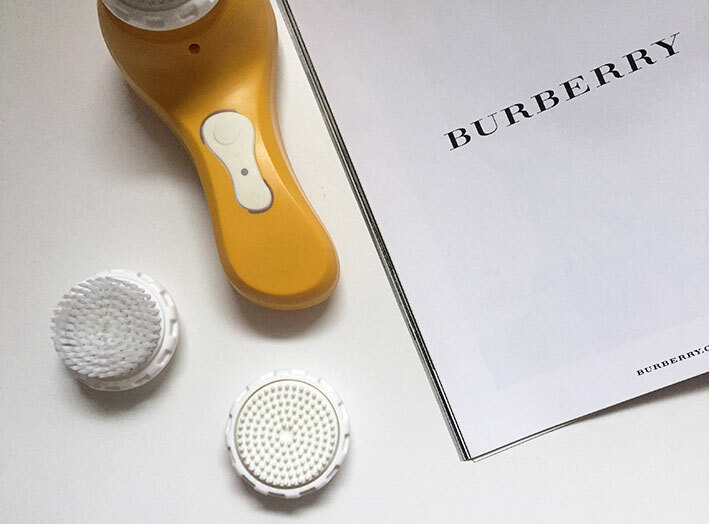 This brush head is aimed at those with a more sensitive skin type, but gives the same deep cleanse that the active brush heads do (the brush head which comes with the Lucid). I really like using this brush head, its super soft and gentle so cleansing twice a day with this brush head doesn't cause any irritations at all and I still felt the same clean feeling I get every time I use the active brush head. Used with Korres Gel Cleanser I definitely felt like my skin was cleaner after every use, no spots popping up, no dry or flaky skin and no sore or sensitive areas. I used the brush head with my Magnitone Lucid, but it is also compatible with the Barefaced and Pulsar. The stimulator has a much rougher texture. a smaller brush with rounded, rubber bristles instead of the soft hair bristles on both my other brush heads. This brush head is aimed to lift and tone while giving a facial massage. I was quite scared to use this brush head if I am honest, it seemed like it would be a lot rougher on my skin than anything I had used before and I wasn't wrong. It is definitely a rougher, but does not hurt one bit. I have used this with both the higher and lower settings on my Magnitone Lucid and I do prefer the lower setting, but it didn't cause any irritations on the higher setting, it just felt very unusual. It does feel like you are getting a facial massage or just a facial in general, my skin feels and looks very lively after each use. This brush head is said to work its best when teamed up with creams, moisturisers and serums. I tried the product with a few of my favourites including Clinique Dramatically Different Moisturizing Lotion+, Dr Sebagh Hyaluronic Acid Serum Repair and Exuviance Antioxidant Perfect 10 Serum. It feels quite unusual to begin, but I definitely feel like the products were able to grip onto my pores better than they normally did. I did prefer using the Serums to the moisturiser however. Again, I used the brush head with my Magnitone Lucid, but it is compatible with the Barefaced and Pulsar. Overall, I adore both brush heads. The Silk Bliss is more of an everyday use, whereas The Stimulator is more of a once a week to twice a week use. My Magnitone addiction is too real. Next on my list: The Full Monty! Have you tried any of these brush heads? Disclaimer: I was sent out the brush heads for free by Magnitone, however was not asked to make this post and all opinions are my own.